For those of you not baseball fans, Tuesday is Major League Baseball’s trading deadline. By that evening, trades of players between teams are sort of over for the year. (Yes, I understand this is the non-waiver deadline and the waiver deadline is at the end of August, but that is complicated to explain.) And so as the end of July approaches, trades can reach a frenetic pace as teams try and fill the holes in their rosters before the playoffs begin in October. 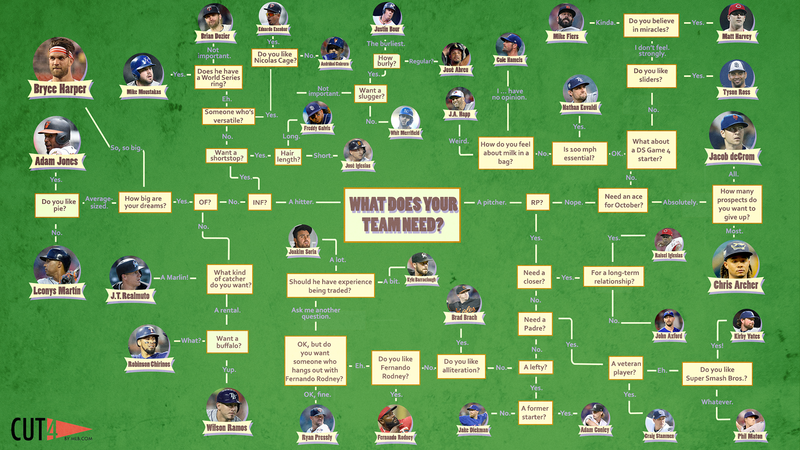 Thankfully the folks over at Cut 4 put together a flow chart to help teams figure out how to fill those needs. A lot of these have paths have already been closed. Of course by this point, a number of these players have already switched sides. In terms of design, this is more like a Friday post. Just enjoy it. Credit for the piece goes to Jake Mintz and Jordan Shusterman. This week I covered a lot of Red Sox stuff. (And I received some great feedback from people, so maybe more baseball-related stats things will be forthcoming.) But, since it is Friday, I wanted to keep today late. 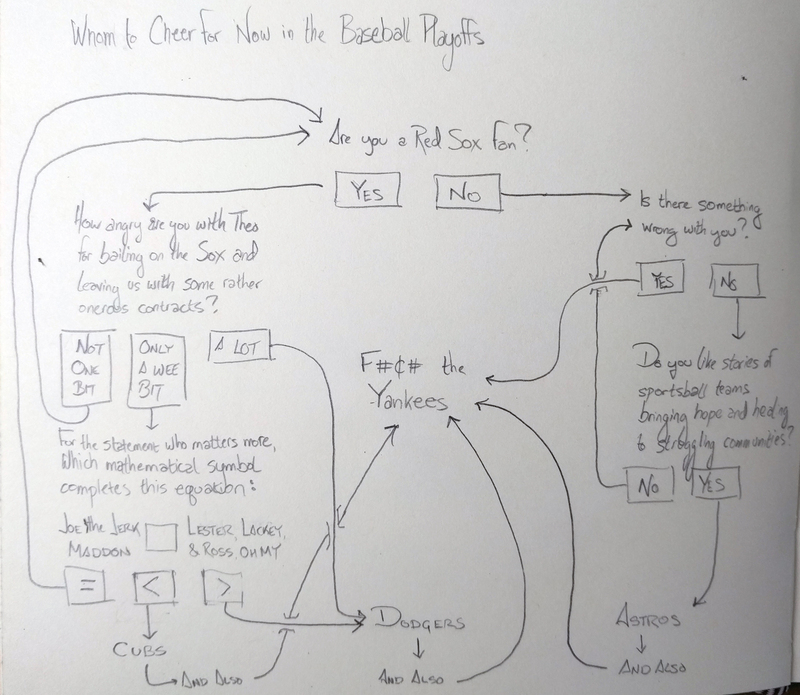 So over breakfast I worked on a flowchart to help you choose whom to root for in the playoffs now that Boston, Colorado, Arizona, Minnesota, Washington, and Cleveland have all been eliminated. To be fair, my second choice was good old Terry Francona and the Indians (like last year). But, the Evil Empire is returning. But did you catch the overarching theme? Well, this wasn’t what I was expecting to post today. But that’s okay, because it’s big news all the same and allows me to get my hands dirty. Yesterday the Washington Post broke news that the United Arab Emirates, specifically Sheikh Mohamed bin Zayed al-Nahyan and the UAE’s national security advisor, arranged a meeting between an official reportedly close to Vladimir Putin and Eric Prince. Who is Eric Prince? Besty DeVos’ brother for starters. But more importantly for the story, a major donor and supporter for and of the Trump campaign. He also has ties to Stephen Bannon, Chief Strategist for the President. Most importantly, the article alleges, potentially damningly, that Zayed would not have arranged the meeting without “the nod” from both Trump and Putin. What was discussed? Allegedly the strategic aim of separating Russia from Iran. Yeah, that’s probably a good thing. But given things like the S-300 surface-to-air missile system, the Bushehr nuclear generating station, and the ongoing support of the Iran-Assad-Hezbollah faction in Syria, it is highly unlikely that Putin would be very willing to suddenly drop his support for Iran. Why is this on my blog today? Well, I have been increasingly curious about all the stories about how various people and organisations are linking Trump and Putin. To be fair, a link is not inherently, necessarily nefarious let alone illegal. 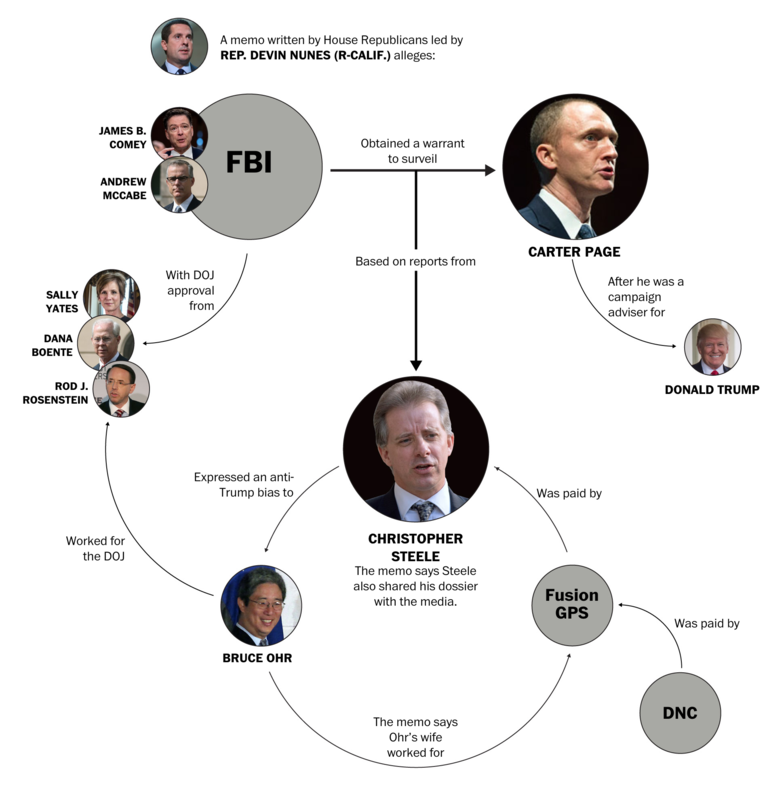 But, given the intelligence collected that Russia was attempting to influence the election in Trump’s favour, and given his electoral college win, and given the known connections, it is important that we look at the breadth and depth of the unknown connections. Prince, Prince, Goose? Because a sheikh is kind of like a prince. And that is what this graphic will be. 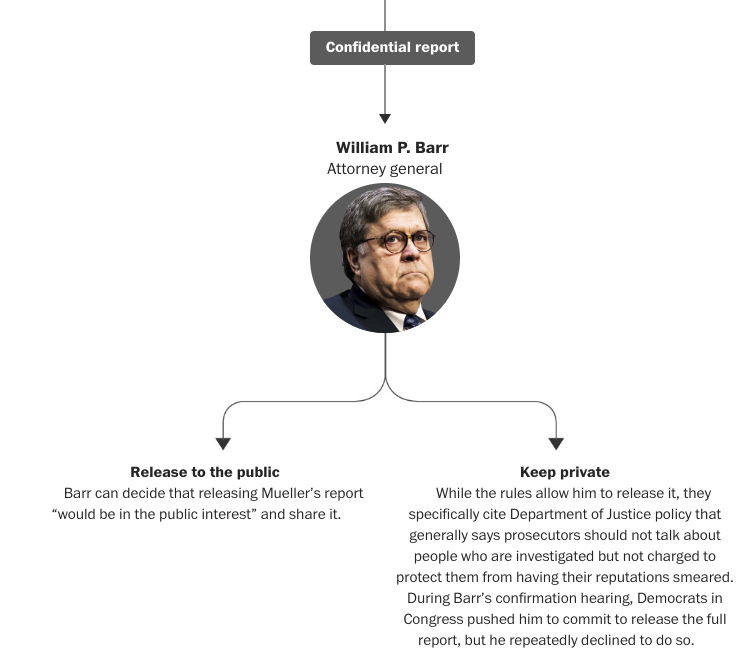 For now it will be a static graphic that I update whenever news breaks—and when I have time to go cite previous news articles—about unveiled connections. Ideally in the future I can turn this into a more dynamic and interactive piece. Credit for the news goes to the Washington Post. Graphic is mine. 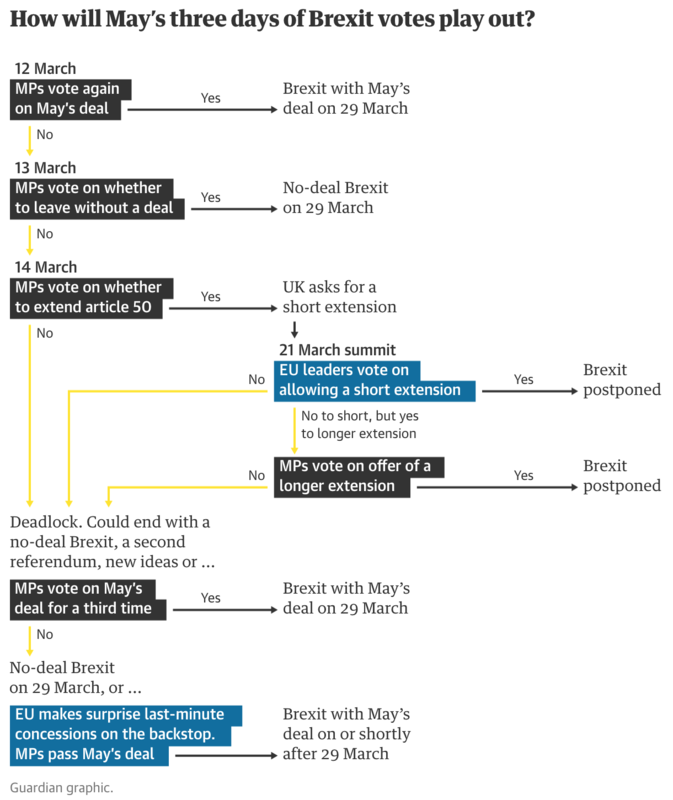 Author Brendan BarryPosted on 4 April 17 4 April 17 Categories Infographic, My WorkTags data visualisation, Donald Trump, flowchart, infographic, information design, politics, Russia, Russia Scandal, Vladimir Putin1 Comment on Prince, Prince, Goose? Well this is it. Well at least for you American readers of this blog. It’s Election Day. If you had told me that this is what it would come to almost a year and a half ago, I would have laughed. But it did. And now it comes down to all of us to vote, unless unlike me you live in a state with early voting. And then when the polls begin to close, nerds of the political and data persuasion will be following the results in state, counties, and congressional districts. And we will be following it all because not all the people on the ballots are named Trump or Clinton. I lived eight years in Illinois. There, you guys are, among others, choosing between Kirk and Duckworth. Here in Pennsylvania, it’s between Toomey and McGinty. Here there is also a referendum on judicial retirement ages. Other districts, counties, and states will have other things upon which to vote. And while local politics and governance impact us the most, let’s face it. We’re all here for the title fight. The heavyweight class: Trump v. Clinton. So today being Election Day, how is it going to turn out? Well I have my thoughts, check them out here, but who really knows? But who also doesn’t want to try and guess? Enter the New York Times. 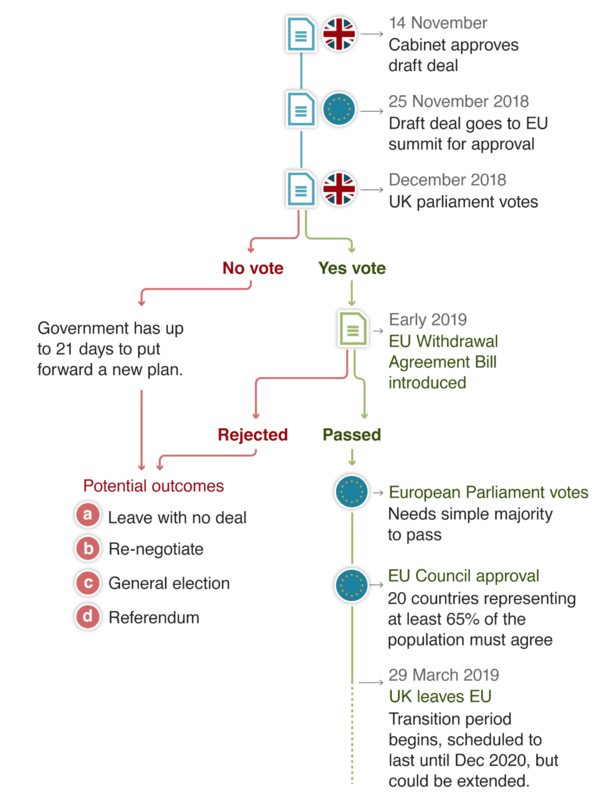 They have a great interactive decision tree that allows you to experiment. 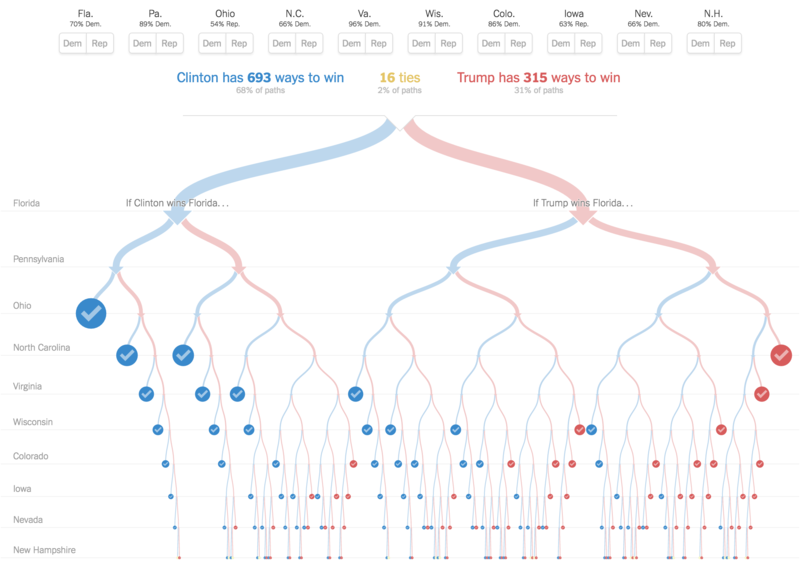 But even without selecting a thing you can see how much more likely a Clinton victory is. She simply has more paths to 270 electoral college votes. But that all said, a Clinton victory is far from guaranteed. If the narrow polls are wrong in any one of her “firewall” states, Trump can win. And while it may seem forever ago, remember Bernie Sanders in Michigan? The polls had him down by at least five points to Clinton throughout the race. He won the state by two points. Now a seven point swing is a bit extreme, and I am not suggesting any state will be in that much error. But three to four points is very plausible. And Clinton’s leads? In many of these states, they are within that uncomfortable margin. So here is a plausible scenario that makes tiny New Hampshire and its four votes the deciding state. So remember, if you haven’t already, go vote. And if I learned anything from Chicago, it’s vote once, vote often. The name of the economic game is efficiency. And that means optimising things. Happy Friday. 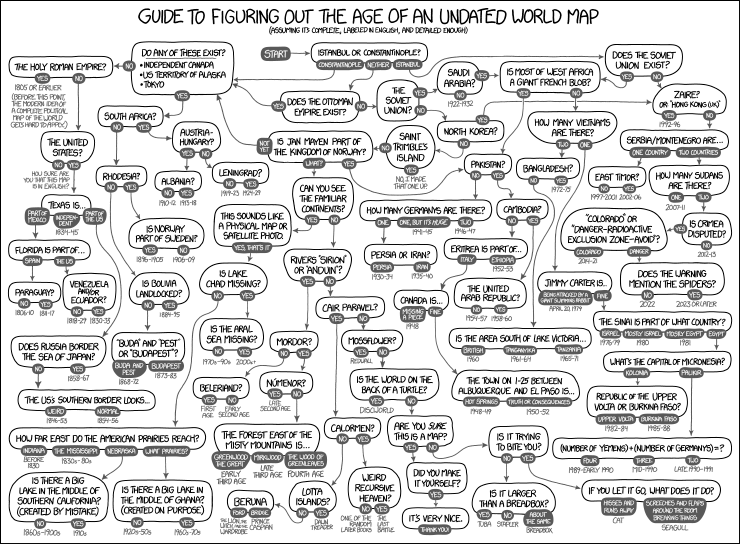 Don’t you just hate it when you stumble upon a map, but you cannot place the time period of the geographies? 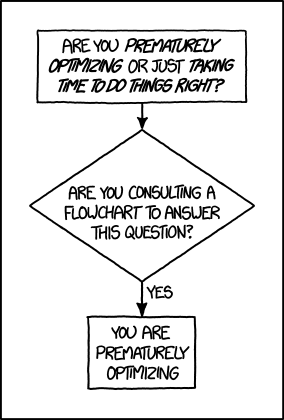 Well if you haven’t, who cares, because xkcd has a great flowchart to help you anyway.